Air Canada-Air Canada unveils New Maple Leaf Lounge at Saskatoon | UNIGLOBE Direct Travel Ltd.
Air Canada announces the opening of their new Maple Leaf Lounge at John G. Diefenbaker International Airport in Saskatoon. Air Canada unveiled its newest Maple Leaf Lounge at Saskatoon John G. Diefenbaker International Airport (Skyxe). The lounge seats up to 40 customers in an elegant space that showcases Canadian design and art, including work by two Saskatchewan artists, Shawn Evans and Holly Friesen. The 137-square-metre lounge features such amenities as a full-service bar offering a wide selection of beverages, including Canadian wines and specialty coffees, a self-serve buffet area and comfortable seating with a view of the tarmac. Business travellers planning to work on site may also take advantage of the cyber counter equipped with PCs and colour printing, complimentary Wi-Fi and access to a large variety of digital newspaper and magazine content via the PressReader app. 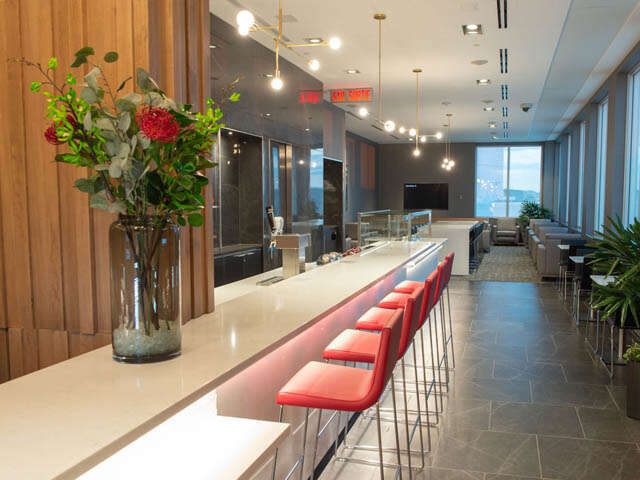 The Skyxe Maple Leaf Lounge will operate seven days a week, and is conveniently located in the departure gate area, steps away from Air Canada's departure gates.